Supreme Court Justice Antonin Scalia died today on a ranch in West Texas. He was out West doing the thing he loved second best, playing with guns. What did he love best? The sound of his own voice. 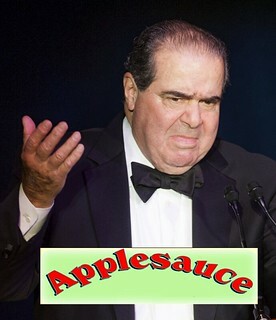 A stunned nation mourns the learned jurist who brought “jiggery-pokery,“ “somersaults of statutory interpretation,” and “pure applesauce“ to the High Court. Justice Scalia also brought George W. Bush to the White House, and willful misinterpretation to the Constitution. He was less “Originalist” than an “original.” We’ll not see his like again. With any luck.